Alyson Cambridge - Rocktopia – On Tour This Spring! American soprano Alyson Cambridge, hailed by critics as “radiant, vocally assured, dramatically subtle and compelling, and artistically imaginative” (Washington Post), noted for her “powerful, clear voice” (New York Times) and “revelatory, sensual, smoky readings” (Opera News), is one of the most diverse and compelling vocal artists on the scene today. Her rich, warm soprano, combined with her strikingly beautiful stage presence and affecting musical and dramatic interpretation, have brought her over a decade of successes on the world’s leading opera and concert stages, including The Metropolitan Opera, Lyric Opera of Chicago, Washington National Opera, Los Angeles Opera, Carnegie Hall, London’s Royal Albert Hall, Deutsche Oper Berlin, Vienna Konzerthaus, among others, as well as recent debuts in Paris, Warsaw, Beijing, and other musical capitals throughout Europe and Asia. Her repertoire includes the beloved heroines of Puccini, Verdi, and Mozart (Mimi, Madama Butterfly and Donna Elvira frequently among them) as well as successful forays into the crossover, Broadway and jazz repertoire, most notably with award-winning and critically-acclaimed performances of Julie in SHOW BOAT and Vi in Gershwin’s rarely performed jazz-opera. Alyson’s debut album, “From the Diary of Sally Hemings,” a song-cycle by acclaimed American composer William Bolcom, premiered at Carnegie Hall’s Weill Recital Hall to rave reviews, and her newest album, “Until Now”, a mix of jazz, pop, and musical theater standards was released in January 2016 on the Naxos imprint Suite 28 Records, and is available on iTunes, Amazon and Spotify. Engagements for the 2017-18 season and beyond include several role debuts, as well as her Broadway debut, a new classical duets recording with soprano Nicole Cabell, and a tour of her jazz/crossover album “Until Now”. Alyson will return to The Metropolitan Opera and Florentine Opera for her role debuts as Hanna in THE MERRY WIDOW, and the title role in CARMEN. 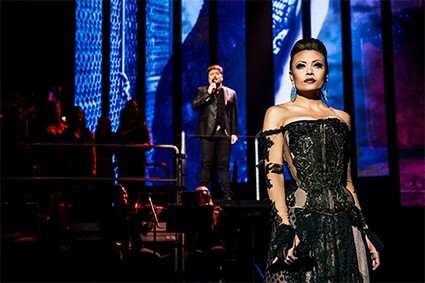 Concert engagements include “A Night at the Opera” concert performances with the Lake Forest Symphony, “Leading Lady: Selections from the Heroines of Opera, Jazz and Broadway” in Irvine, CA., and a solo concert with the Milwaukee Symphony. Recent engagements for Alyson include title role of MADAMA BUTTERFLY with Florentine Opera, her role and company debut with the Spoleto Festival USA as Bess in PORGY AND BESS, debuts with Nashville Opera as Donna Elvira in DON GIOVANNI, and debuts with both Dallas Opera and Kentucky Opera in one of her most celebrated roles, Julie in SHOW BOAT. She also debuted with Washington Performing Arts at the Kennedy Center in solo concert, premiering two new commissions written for her, and in William Bolcom’s song cycle, “From the Diary of Sally Hemings”. Other recent and notable career highlights have included: her Lyric Opera of Chicago debut season as Giulietta in LES CONTES D’HOFFMANN and Julie in SHOW BOAT; three seasons with Washington National Opera (Musetta in LA BOHÈME, Clara in PORGY AND BESS, Julie in Show Boat); her Deutsche Oper Berlin debut (Donna Elvira in DON GIOVANNI); Polish National Opera (Violetta in LA TRAVIATA); three seasons with Opera Theatre of St. Louis (Mimi , Juliette in Romeo et Juliette, Frasquita in CARMEN); Los Angeles Opera (Clara in PORGY AND BESS); two seasons with PORT Opera (Donna Elvira and Musetta); Boston Lyric Opera (Mimi); and solo concert performances with the Vienna Kamerorchester and Munich Philharmoniker with tenor Joseph Calleja, San Francisco Symphony, National Symphony Orchestra, Festival de Saint-Denis, a special recital for the US Justices of the Supreme Court, and the internationally radio and TV broadcast concert special “Music and the Spoken Word” as the featured artist with The Mormon Tabernacle Choir, her debut at London’s Royal Albert Hall (Francesca Zambello production) and Florentine Opera as Mimi in LA BOHÈME, and the title role in a newly-commissioned opera, CLARIMONDE, by renowned French composer and conductor Frederic Chaslin, her company debut with San Diego Opera as Mimi their 50th Anniversary season opening new production of LA BOHÈME; Musetta in a new production of LA BOHÈME at Washington National Opera, her debut with the Madison Symphony Orchestra and Spoleto Festival USA Aymphony for Barber’s KNOXVILLE: SUMMER OF 1915. She was also featured appearances at BET’s Soul Train Music Awards, marking the first performance by an opera singer on the awards show, which was broadcast live on BET and Centric TV networks; the Kennedy Center’s Holiday Concert for U.S. Troops, performing alongside Kristen Chenoweth, Gary Sinese, Marlee Matlin, and more, which will be broadcast on PBS; a Recital at The Supreme Court of the United States with bass-baritone Eric Owens; and the Viennese Opera Ball of New York at the Waldorf=Astoria, at which she hosted and performed. She has worked with an impressive and noteworth roster of Maestri, including: James Levine, Seiji Ozawa, Sir Simon Rattle, Frederic Chaslin, Emmanuel Villaume, Marco Armiliato, Philippe Auguin, among many others. Ms. Cambridge’s prodigious career got off to an auspicious start – as a graduate of the Metropolitan Opera’s Lindemann Young Artist Development Program and Grand Prize Winner of the Metropolitan Opera National Council Auditions, she made her MET debut in 2004 as Frasquita in CARMEN under the baton of James Levine and has since sung numerous roles with the MET over the past seven seasons, including roles in two live HD broadcasts (THAIS and LA RONDINE). As part of Ms. Cambridge’s personal mission, and with a strong desire to give back and make an impact beyond the traditional confines of the theater, she lends her time and talent to charities and causes close to her heart, including Sing for Hope, The Humane Society, K9s for Warriors, Hope For Hearts Foundation and American Red Cross. And, as a former athlete and fitness enthusiast, with a penchant for fashion, Ms. Cambridge’s exotic looks (her father Caribbean/African, her mother American/Scandinavian) have enabled her to enjoy collaborations with designers for her concert performances and off-stage appearances. She serves as an official brand ambassadress for luxury jewelry and watch designer Chopard and fashion designer Vivienne Tam.